First we started using virtualization. 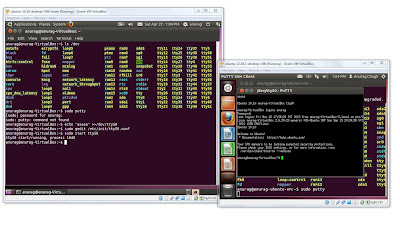 We use a Windows 7 PC (Linux can be used as well) to host Ubuntu as guest using VirtualBox. We use the "oh so awesome" SublimeText editor to edit the source code of the kernel module we are developing on the Windows PC. We shared the source code folder with the Ubuntu virtual machine (VM). This made life easier because it decreased the time to reboot Ubuntu in case of a hang. And whatever few seconds were involved in reboot could be used to look through the code on the unaffected source editor which ran outside the testing machine. This setup of course would only suit you if you aren't working on developing driver for devices connected to your system bus - you will need a real physical PC running Linux exclusively for that. Connect a null modem cable between the COM Ports of the PC under test and you development machine. If you are using laptops, you might need USB-to-Serial convertors. Once that is done, use PuTTY and configure it to open a console over serial at 115200 8N1. We use virtualization. We have two Ubuntu guest VMs on our Windows PC - one is the PC on which we test our kernel module and the other VM is used to fetch the kernel messages from the PC under test over a virtualized serial connection. To setup a virtualized serial connection between the two virtual machines look here. If you are using such a setup, make sure to start that virtual machine first which is configured to "create the pipe", otherwise the other machine would not startup because it will failt to connect to the as yet non existent pipe. Configure the Ubuntu PC under test to provide a console over serial port. Gained console access over serial port. The left VM is the machine under test. The right VM is used to access the console over virtual serial. In that file change GRUB_CMDLINE_LINUX="" to GRUB_CMDLINE_LINUX="console=ttyS0,115200n8 ignore_loglevel"
Now you have console access over serial port to the test machine as well as live real time updates of kernel messages over the same. You can configure PuTTY to even log the captured kernel messages in a file. PS: The host pipe method is not that stable, so an alternative is to use VM's serial port in Host Device mode. What you have to do is make sure that your hardware has two serial ports - you can add serial ports using USB-Serial converters. Lets say that these are COM11 and COM12. What you have to do is to open the settings page of the Ubuntu virtual machine in VirtualBox and set the COM1 of the virtual machine in "Host Device" mode and set it to receive and forward all data from/to COM11 of the Host machine. Then you can connect a NULL modem between COM11 and COM12 and use PuTTY on the Host OS (in my case Windows 7) to display the data received on COM12. This involves using hardware to feedback the data from the Guest OS's serial port back to the Host OS's serial port.